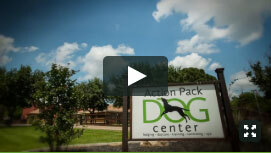 Action Pack Dog Center is the area’s most award-winning facility for dog boarding, dog daycare, and dog training. Our Round Rock, Georgetown, and Liberty Hill, TX locations each have spacious overnight accommodations as well as a fun-filled dog daycare program. Our Round Rock and Georgetown locations offer effective, dog-friendly training programs for dogs of all ages. Give us a call to learn more! We are so excited to meet your pup, we’d like to offer his/her first night free. Discount subject to availability and cannot be combined with any other offers. Applies to first-time boarding customers only and is valid for any accommodation selected. For more than 10 years, Action Pack Dog Center has provided a haven for pets to have fun, stay engaged, and rest easy. Each of our three locations offer premium overnight accommodations, complete with individualized care and TLC. Discover our enriching activity packages for the most fun-filled experience. Hours of constructive play, supervised socialization, and structured activities make our dog daycare program the perfect doggy’s day out. With plenty of space and lots of new friends, even the most energetic pups will come home satisfied after a day in our indoor/outdoor daycare. At Action Pack Dog Center, we’re passionate about helping people find the healthiest, happiest relationships with their dogs. We’ll help you better understand your pet and bring you closer together with results-driven, positive-based training methods. Our furry guests can expect the best pampering and beautification at our grooming spa. We offer everything from haircuts to luxury treatments. With practiced techniques, our salon staff specializes in delivering comfortable results for dogs of all kinds. Does your dog love playing in the water? Visit Action Pack Dog Center for supervised playtime in our spacious swimming pool designed just for dogs. 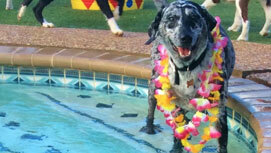 Add a swim & play package to your dog’s overnight or daycare visit for an extra splash of fun! Our spaces fill up fast! Making a reservation is the best way to get you and your furry friends booked for Dog Training classes or Dog Boarding. Call our Round Rock location at (512) 341-0229, our Georgetown location at (512) 240-6080, or our Liberty Hill location at (512) 515-0499 to check availability or send us an email here. With acres of outdoor romping grounds, we’re a slice of the country nestled in the heart of the city! Our dog daycare, boarding, and training is designed with your dog in mind. Learn more about us! Liberty Hill, TX - Now Open!